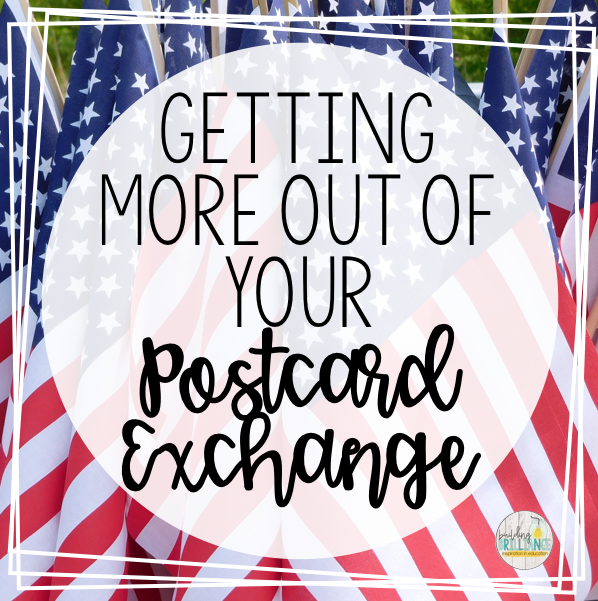 Last summer, I saw this post on Facebook about a Postcard Exchange. I had never done one before, but was instantly intrigued by the idea of my kiddos getting a postcard from each state around the US. I quickly signed us up for Oregon and then started to worry about what I had gotten myself into! Am I the only one around here who acts first and thinks second?! 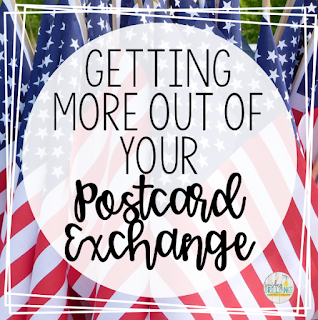 I was grateful that my school was willing to cover the cost of the postcards and postage, because I definitely didn't think about the cost of those before hand. I found a great deal on sets of 20 postcards from Amazon. Several other classes sent us handmade postcards on cardstock, and that definitely worked too! 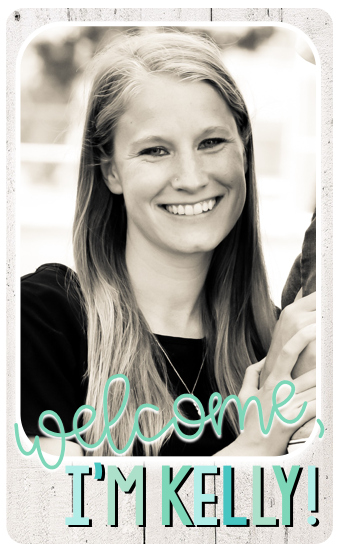 "We are a second and third grade class from a small town in Oregon. There are a lot of farms here, and each day we can see deer, birds, cows, chickens, pigs, horses, goats, frogs, sheep, dogs, and cats. We even have buffalo, llamas, camel, and a zebra in our town! We have 32 students in our class. Our school motto is “Preparing, Caring, and Daring”. This means that we are respectful, responsible, and safe. We always try to do the right thing, and we don’t have bullies at our school. Our two favorite Oregon college sports teams are the Oregon Ducks and the Oregon State Beavers. We don’t argue about much, but we do argue about which team is better! We love living in Oregon because it is beautiful here. We have mountains that get snow in the winter, we have the coast, where we can play in the waves in the summer, and we have lots and lots of grass and flower that grow all around us. We believe that we have the best school in the world! We can’t wait to hear about your state and your school! Love, Mrs. Bates 2nd & 3rd grade class"
I was pretty proud of what all they thought to include. 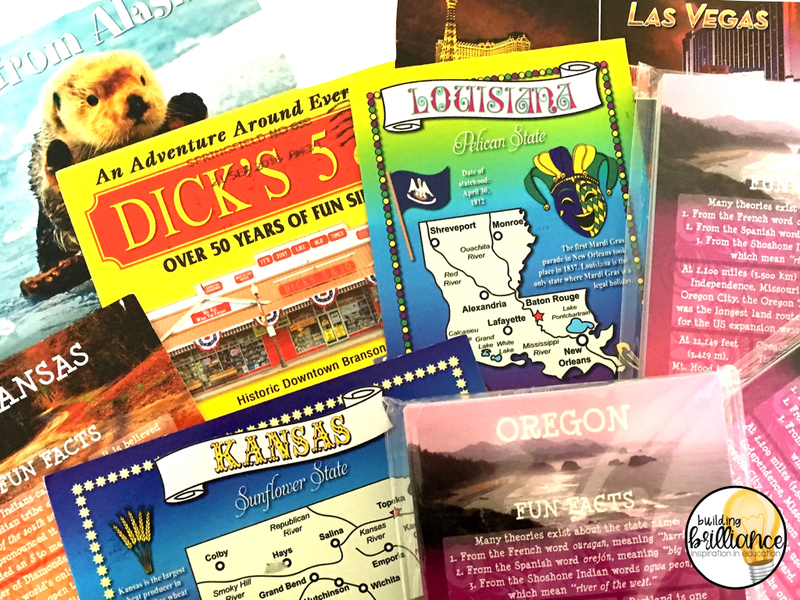 Our favorite postcards that we received included more than just a few facts about the state, so I hope that other classes enjoy it too! 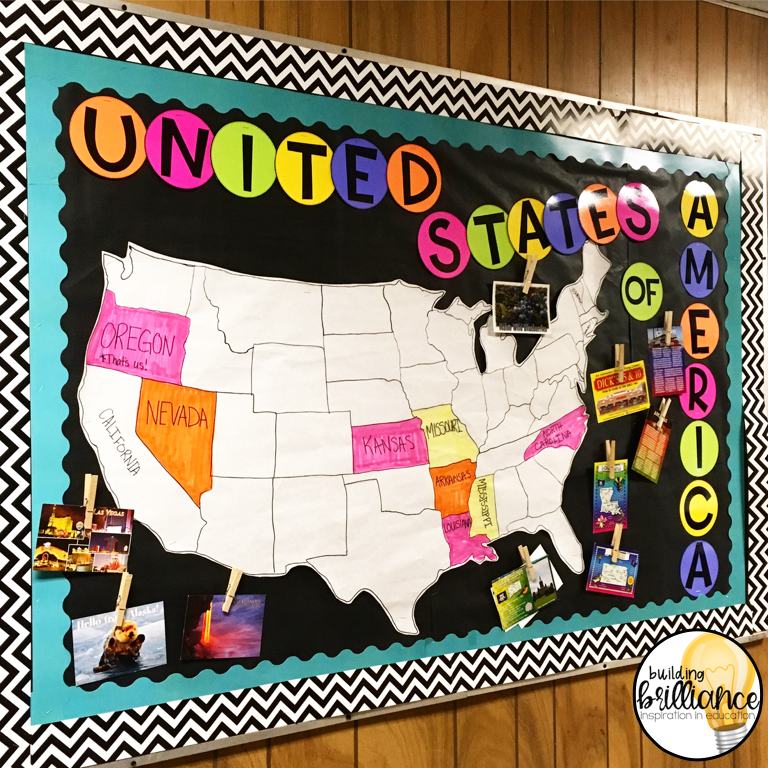 It started with this bulletin board. 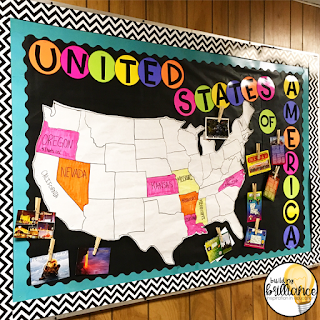 As postcards came in, we colored in the state they came from and pinned up the card for, not just our class but anyone who walked through our hallway, to check out. 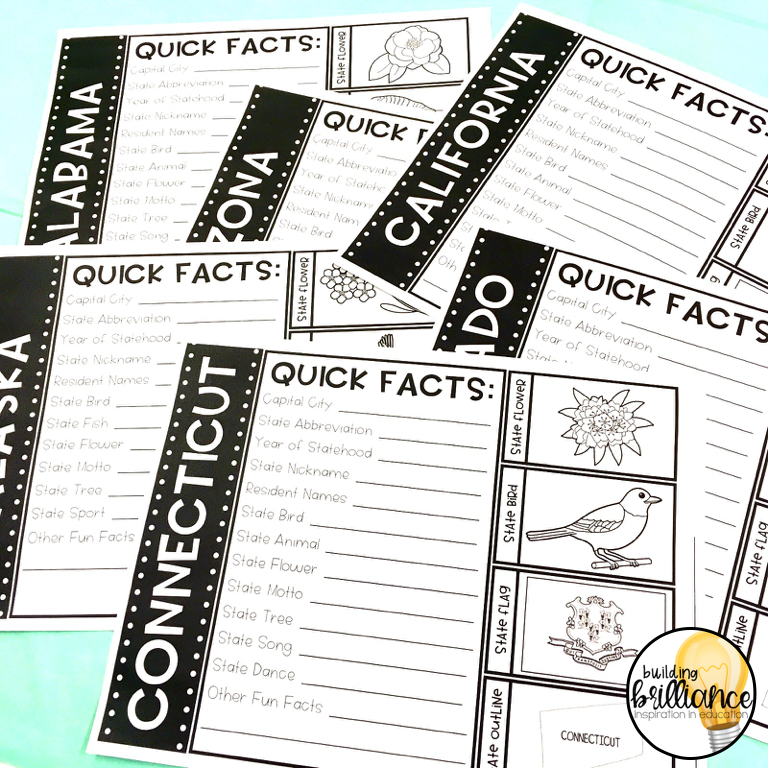 We discussed the facts on the postcards themselves, then did a quick web search to search for a few more facts. You could leave it at that, but I wanted more. 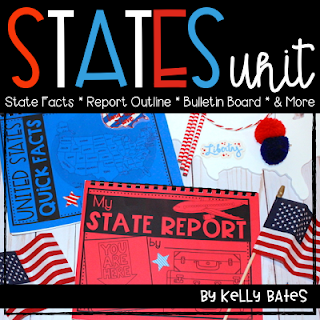 I broke my students up into table teams and had the use an iPad to find facts about each state. 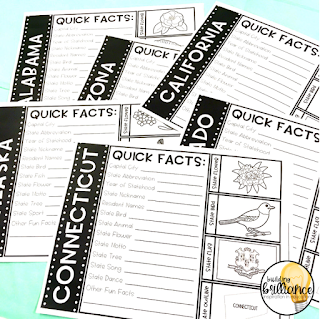 As they completed each state, they would glue their information sheets into their spiral notebook. I believe that when kids actually have to research, they will remember better, and this definitely made it more engaging for them! (On a related note, my kids use the search engine kiddle.co (yes, .co, not .com). It is a search engine created by Google with kids in mind. While it's not perfect, and we still talk about appropriate internet use regularly, it is by far better than using Google! 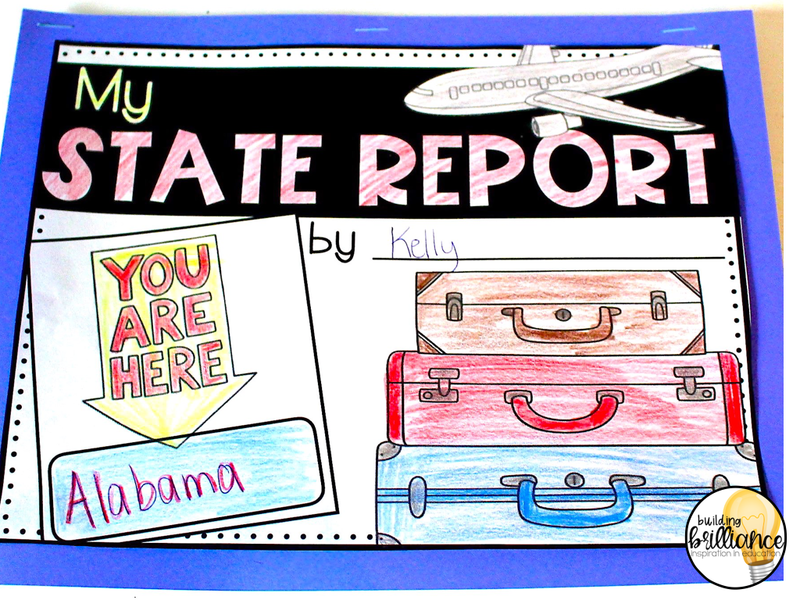 We finished off our year with each student completing a state report. They had already practiced how to do research and find important facts, so it made completing this much easier. I used a random generator that I found on Google, quickly cut and paste all the states into it, and had students come spin to choose their state. I could just assign one, or even have them pick their own, but this is more fun and my class always gets a kick out of it! I am absolutely a huge fan of Postcard Exchanges. There are so many ways that you could use them to make meaningful and authentic learning in your classroom far beyond what I did. If you are on the fence about trying one, jump on that wagon! But make sure you do your part...in the end, we were about 10 states short, because for whatever reason, classrooms didn't send their cards. That was definitely disappointing for my students.